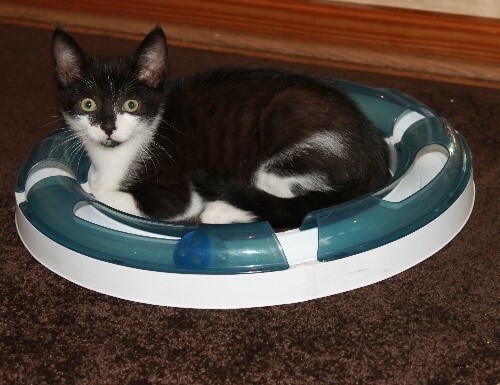 Boo – 7 months old, male, black and white. Boo originally came in with his litter mates who have now all gone to their new homes but lovely Boo is still waiting for his. Boo is energetic, fun and very loving but he can also get very frightened if he thinks he is being cornered by humans or restrained in any way. Boo has had lots of positive reinforcement work done with him to accept being handled, he just needs to be able to trust you and carry on with his training. Boo is good with other cats but he has not met dogs yet. Boo can be rehomed with children over 10 years old but it would be better for him if it is not too noisy or busy as he gets quite worried over loud screams or rough handling due to his past events.